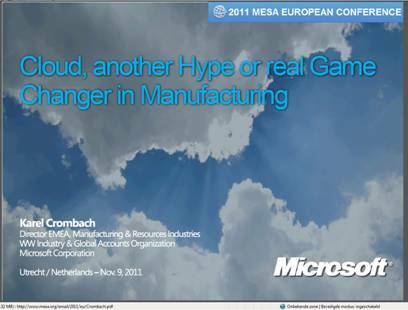 Nov. 2011 – Cloud, another hype or a real game changer in manufacturing? Cloud, another hype or a real game changer in manufacturing? The MESA International 2011 European Conference held in November in The Netherlands, brought together manufacturing executives and industry leaders to share best practices for achieving operational excellence, applying new technologies and improving business processes in manufacturing operations. Keynote speakers addressed amongst others the move to cloud computing applications, specifically in the MES-domain. HAI offers real-time cloud computing solutions in the MES-domain for the semi-process industries, with extra focus on at-line quality management, SPC and OEE.